Efficiency is the magic word in any industry whenever mass production methods are being designed. This is particularly true of the weighing process. The ideal weigh process is easy for workers to operate, delivers a measurement of weight that is of an appropriately high resolution to the task, and can be recorded with ease.Or even a completely automated system that feeds numbers directly into your data framework. One recurring theme of the standard operation of platform scales is that employees manually place an item on the weighing station. Whether it is an airline worker on a tarmac weighing some luggage, a shipping and handling employee in a warehouse weighing some packages, or a manufacturing employee weighing flour in an industrial scale bakery, the important thing is that the scales be safe to use and reliable. Another application that may be less obvious is weighing passengers. There are numerous concerns here that a low platform scale addresses. The first is comfort and safety of the passenger. There is a smaller risk of injuries related to tripping or stubbed toes with a low profile scale. From the standpoint of sensitivity, privacy and customer service, the easier the use of the weigh platform for the customer, the better. This also makes it easier to accommodate passengers who use wheelchairs, and may need assistance getting onto the weigh platform. A platform scale that is too high off the ground can be inconvenient, and even hazardous depending on the situation. With a low profile platform scales from Arlyn, you eliminate many potential concerns. With a platform height of 1 ⅞ inches, the work of placing boxes, bags, suitcases, or people on and off the platform requires far less time and energy. For luggage, it opens the possibility of using efficient tools like dollies which are great for preventing back strain and injury. Not only does this allow you to take care of your people, which is extremely important for any successful business, you can retain experienced staff and prevent workers comp payouts, or even potential lawsuits by providing a safe work environment. There are few things more disappointing than ruining a batch of cookies by dropping some ingredients. This is multiplied exponentially once you raise the stakes to industrial scale production, where measuring cups and teaspoons won’t do the trick. Instead, hundreds of pounds of baking goods are weighed at one time. Not only is there cleanup if some of these drops, there are health and safety hazards from those ingredients, concerns over using food-safe cleaning products and meeting health and safety standards, and worst of all the money and time lost by a failure in the process. If you have to weigh ingredients on the level of hundreds of pounds at a time, don’t make it necessary to risk lifting this weight to high. Use a low scale that minimizes the risk of accidents and spilled goods. 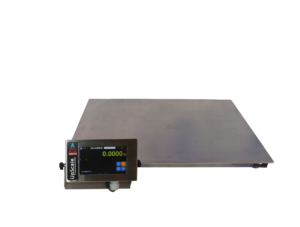 Industrial baking professionals have been known to use the Arlyn 3200 low profile platform scale to create a safe, reliable and efficient weighing system. A swiveling graphic digital display system mounted on Arlyn Scales can adapt to locations like farms, tarmacs, factories, and anywhere you need to weigh your materials. They are good for environments that can get wet due to rainwater, condensation, washing spray, or any other water hazard near your place of work thanks to a rubber gasket surrounding the swiveling display mount housing. Store relevant information like tare weights with the scale’s preloaded software. You can save up to 100 tare weights, making this a flexible scale for a number of different weigh methods. You could have tares for your forklifts, braces, crates, dollies, and any other transportation equipment you need. Any of these can easily be accessed at the push of a button, keeping your workflow efficient and smooth. To further assist you and your industry in using Arlyn’s low profile platform scales, we are ready and able to provide ramps that are appropriate for the nature of your work. These ramps can work with any of our scales securely with optional anchor plates to make sure that it won’t slide and skid back and forth while being used. A small gap between the ramp and scales guarantees that the weighing process of the scale will never be meddled with by brushing against the ramp. The anchor plates keep the ramp from being pressed against the weighing platform when a handheld forklift or dolly is rolled over the ramp. Platform scales from Arlyn 3200 series come in capacities of either up to 500 pounds, or up to 1,000 pounds. These rugged and durable scales have a load cell in each corner of the platform, a design which allows for the low and tight design. Many comparable scales construct their load cells from aluminum, but Arlyn uses a strong stainless steel alloy. This alloy is much stronger, and can do a better job of withstanding impacts from weights that are dropped suddenly, either because of the speed of the workflow, or an accident. This stronger material can also be used to build a smaller load cell than one constructed of aluminum, thus also allowing for the low profile platform. If you know that a low-profile scale is the right choice for your industry, Arlyn Scales will be happy to help you figure out the best option for you. We look forward to hearing from you either from a phone call to 800-645-4301 or a visit to our website.